There is a reason the words "Flash' and 'Ferrari' star with the same letter; Think film stars, financiers, formula one racing drivers. If you're shy and retiring get a Volvo. 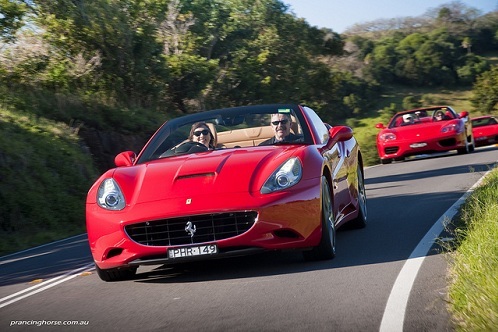 As our article on Ferrari touring shows there is nothing quite like getting behind the wheel of an Italian stallion. You can experience life in the fast lane without the buy-one-yourself price tag with the following tours. Design and operate exclusive, tailor-made supercar tours for individuals and private groups to Italy. Based in UK with a booking service through the US. The company has also planned supercar tours in England, so perhaps once you have enjoyed Tuscany in a Ferrari, you can try the Cotswolds in an Aston Martin. The Toys: Ferrari 458 Italia, Ferrari California, Ferrari 430 Spider, Ferrari Scuderia, Ferrari 599 GTB and a host of other supercars should you wish to try something different. You can Experience the ultimate Australian Ferrari test-drive featuring a rare collection of current and classic model Ferraris. Day trips or weekend tours are available down the scenic East Coast south of Sydney, through national park and along the cliff-hugging Grand Pacific Drive. The Toys: : Ferrari California, Ferrari F430 Spider, Ferrari 360F1 Spider, Ferrari F355 Spider and the 'Magnum-P.I.' 1988 Ferrari 328-GTS. The company creates Ferrari tours of Italy, eating at the finest restaurants and staying at the best hotels. For example, Baglioni hotels runs Ferrari tours in conjunction with Red Travel. Book in Australia through Luxury Travel Concepts run by the knowledgeable Mel and Stella Haycock. Luxury Travel Concepts can also book you on a nostalgic Alfa Romeo tour of Italy. Looking for rental rather than an Italian tour? Ferrari, Maserati, Lamborghini, Porsche, Aston Martin, Bentley, Rolls-Royce, Maybach, Pagani, Jaguar, Hummer, KTM X-Bow, Audi, Bmw, Mercedes can all be rented from these operators based out of in Rome, Florence, Milan, French Riviera and Switzerland. The areas of Modena and Bologna are famous for the production of luxury sport cars, not only Ferrari but Lamborghini, and Maserati are made here. Why are all the glitziest cars Italian? With more than 20 private collections and museums in the area this company can organise a exclusive tours to private car collections.